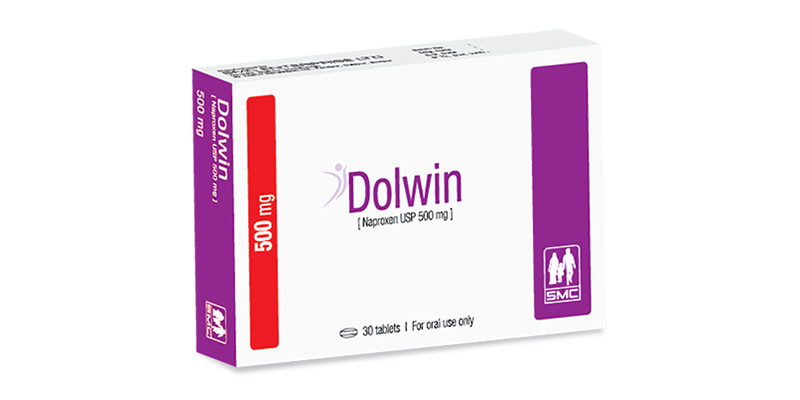 Dolwin tablet: Each tablet contains Naproxen USP 500 mg.
Dolwin (Naproxen) belongs to a group of medicines called Non-Steroidal Anti-inflammatory drugs (NSAIDs), which are used to reduce inflammation and pain in joints and muscles. Naproxen reduces the prostaglandin synthesis by inhibiting the enzyme, cyclo-oxygenase. Thus it produces anti-inflammatory, analgesic and antipyretic actions. Naproxen cannot cure arthritis but is used to give relief of some symptoms such as inflammation, swelling, stiffness and joint pain. In rheumatic disease: 0.5-1 g daily in 1-2 divided doses; child 2-18 years. Juvenile idiopathic arthritis: 5 mg/kg twice daily (max, 1 g daily). Acute musculoskeletal disorders and dysmenorrhea: 500 mg initially, then 250 mg every 6-8 hours as required; max. dose after first day 1.25 g daily. Acute gout: 750 mg initially, then 250 mg every 8 hours until attack has passed. Or as directed by the physician. Naproxen is generally well tolerated, but occasionally patient may complain gastric discomfort, nausea & dizziness. In exceptional cases, very sensitive patients may suffer from gastro-intestinal bleeding, skin rashes and thrombocytopenia. Use of Naproxen should be avoided in patients with gastro-intestinal disorders and gastro-duodenal ulcer. In case of severe hepatic or renal damage or disturbance of cardiac function, a close medical surveillance is indicated. Blood counts including platelet counts, as well as monitoring of hepatic and renal functions are recommended, particularly in patients under long-term therapy. Lactation: Naproxen should be avoided during lactation period. This preparation is contraindicated in patients with known hypersensitivity to Naproxen or any other components of this preparation. This preparation should not be given to patients who have experienced asthma, urticaria or allergic-type reactions after taking aspirin or other NSAIDs. Severe, rarely fatal, anaphylactic-like reactions to NSAIDs have been reported in such patients. Antacid: The absorption of Naproxen can be altered by antacids. Aspirin: Plasma concentration of Naproxen can be reduced when Aspirin is given concomitantly, this appeared to be due to increased excretion of Naproxen. Diuretics: Naproxen diminishes the effect of Furosemide. Probenecid: It increases the plasma concentration of Naproxen. Dolwin tablet: Each box contains 3 x 10’s tablet in blister pack.